There are moments in life when some believers are just so angry that the only person they feel safe talking to is God. And that may be a healthy response, new research suggests. A study exploring how prayer is used to cope with hostility found that talking to God appeared particularly effective when dealing with intense, lasting anger involving family members. When a sense of anger seems overpowering, “prayer may be an effective, safe, and easily accessible way for adults to manage these negative emotions,” researchers from Northern Illinois University and Boston University reported in the Review of Religious Research. Two other studies – one measuring images of God and perceptions of others and one following Bosnian war veterans – also indicate prayer can be an effective means of reducing hostility. Yet there are also times – such as when the anger is directed at family or friends or in coping with images of slaughter and war crimes – that only a divine shoulder may do. Studies have found religion in general is linked to improved mental health, but not all types of faith and not for all people of faith in all situations.So, for example, individuals who view God as loving and caring are better able to cope with setbacks such as illness and unemployment than people who consider the divine to be distant and judgmental. The latest research on prayer and anger delves deeper into the ways conversations with God appear to help some people transcend anger and find peace. •	Those who reported that their anger lasted more than one day were four times as likely to report using prayer to manage anger as those who reported that their anger lasted less than an hour. •	Ruminating about their anger only made it more intense. Respondents who thought about the event “every once in a while” were about half as likely as those who thought about the event “all the time” to use prayer to manage anger. •	The stakes are higher with family members. People angered at work are 36 percent less likely to use prayer to manage anger than those angered by family members. When it is difficult to turn to one’s immediate social network for support, “a supernatural other such as God” may be a more appropriate, comfortable, and accessible source of support, the researchers indicated. Prayer rituals and war trauma: The 100 Bosnian veterans experienced similar traumas during the 1992-1995 war in Bosnia and Herzegovina: Having family members killed, collecting body parts, watching while fellow soldiers die in their arms. What made a difference in their lives after the war? Prayer, according to a study published in the December 2017 issue of the Journal of Religion and Health. 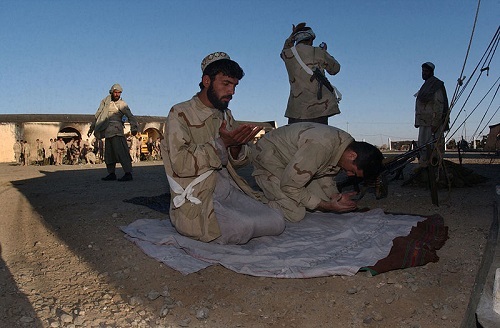 The 50 veterans who regularly said the five daily prayers that are a pillar of Islam were significantly better able to assimilate social norms, take pleasure in their surroundings and avoid risky or impulsive behavior than veterans who did not perform the daily prayers. Those who prayed regularly also were more affectionate. In contrast, researchers found that veterans who did not pray regularly reported significantly higher levels of anger. They were less able to control themselves in their rage, disgust, fear, and terror. Religiosity “may represent one very effective way to achieve larger resistances to different stress factors in everyday life, and especially in extreme, catastrophic situations like war,” the researchers said. Priming peace through prayer: In two experiments, Dutch Christians were asked to pray for or think of a person in need. Then they were shown photos of the eyes of several different people. In the first study, people who prayed before seeing the photos were less likely to perceive negative emotions in the eyes of others. The study was replicated with a new group in the second experiment, who this time were also asked about their perceptions of God. 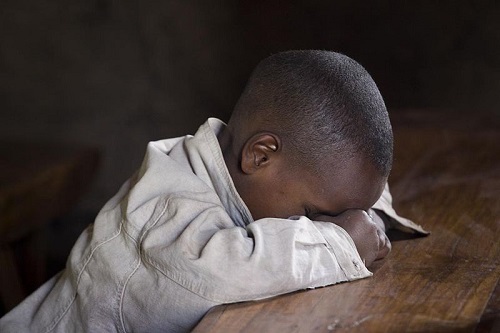 Prayer was again found to lower the perception of hostility, but only among participants who viewed God as caring, comforting and supportive, as opposed to punishing and passive. “These findings suggest that positive God beliefs may help to promote prosocial attitudes and cooperation within religious communities,” researchers reported in the Religion, Brain & Behavior journal. There are oft-told jokes, and even a popular video, about the good vibes at church lasting about as long as the search for a parking space or the race to be the first out of the lot en route to the pancake house on Sunday morning. Yet research suggests faithful people are not helpless in finding spiritual ways to control their anger. Particularly if they turn to prayer. Researchers in the Northern Illinois and Bosnia studies encouraged physicians and pastoral and secular counselors to be sensitive to religious and spiritual issues such as the role of prayer that may need to be addressed to promote healing.